Great fun for everyone, a steady hand, patience and an amount of concentration is required to master this Olympic style sport. Safety comes first so you will guided through all of the aspects of operating your rifle before the competition rounds. Air rifle shooting is great fun for all ages and abilities and can be a part of any activity event, whether an adult or children's group. A steady hand, patience and an amount of concentration is required to master this Olympic style sport. 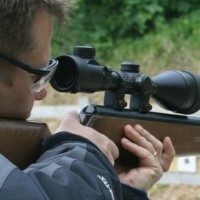 As with all activities we provide, our air rifles events put your safety first. Qualified instructors will gently guide you through all of the aspects of operating the rifle and ensure you are comfortable at all times. Combine this fun activity with archery or many other activities, or book an air rifles session on its own.